I don't have a lot of words today my friends. I'm feeling a bit lazy. Some days .... well, it just feels darn good to be lazy. Maybe I'll just continue that laziness into the weekend! Here's to lazy weekends, sunshine and afternoon naps! Sounds like an excellent plan! 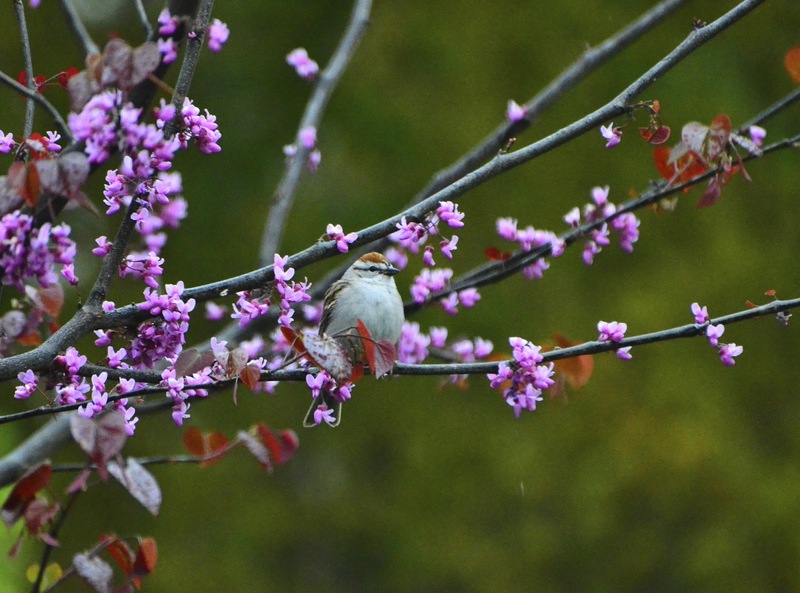 Enjoy the birds and the pleasant weather. Excellent thought. Enjoy your weekend and I hope the sun shines on you and the birds. Love your colorful birds and flowering trees and a lazy attitude!! Definitely ready for some lazy time here!! 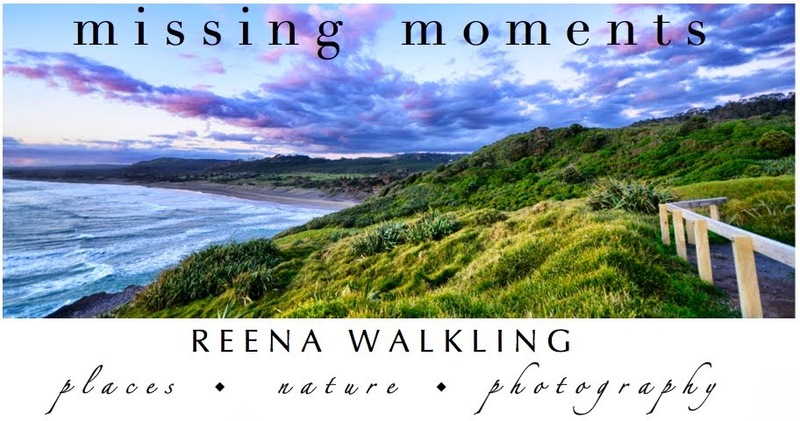 Enjoy your weekend, Reena!! Lovely vibrant colours :-) I am hoping for a lazy weekend. An afternoon nap sounds great to me... but it's evening here already. Can I have an evening nap? I wish some days that I could nap. If I take a nap, I can't sleep at night... unless I am sick. Hope you have a peaceful weekend enjoying the sights. What fun pics you got of different birds in the redbud tree. Redbuds can be difficult to photograph (at least for me) because the blossoms are so tiny. Oooh, what a wonderful idea, too bad I can't join ya, but I have a lawn to mow, fence post to put up and enough yardwork to keep me busy all weekend! Guess I'll have to be lazy next week. Love all your little birdies, looks like they are kickin' back too. Have a great weekend Reena! 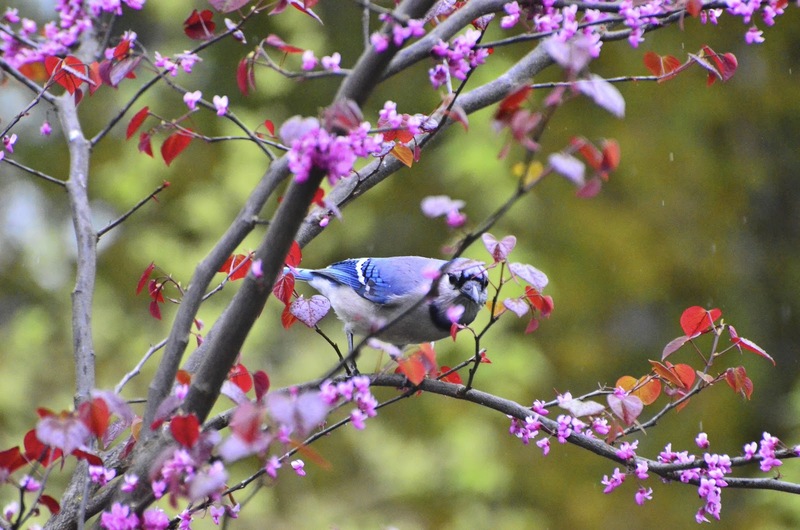 The colorful birds in the colorful trees are spectacular! After everything you did up in Maine, you need to take it easy for a few days. I think it's important that you do this. So there you go. Tiny beauties hiding in a greater beauty...you are wonderful even when you are lazy!!! You don't need words Reena .... These beautiful pics say it all. I wish you a nice week-end! It seemed like the birds have heard that. They are lazy too to fly away. It's all right, your colors speak for you! Relax, take your time. When you do something, it is very good, like photographs, keep them coming, slowly. It is good to relax. Wonderful.. your birds a lovely to see. 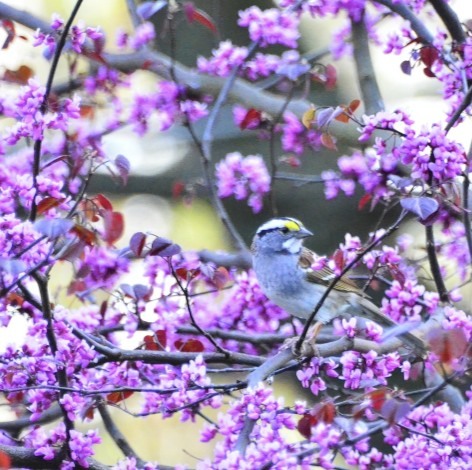 Beautiful birds among those blossoms! and some days it is just okay to be by yourself...they are all so precious looking! No words to describe these. They can only be imagined in a dream. You always have the best ideas for a great weekend... Love your photos my friend..
Reena, the colors in these are just gorgeous! Lovely bird shots. I agree there are times to relax, be lazy and nap and weekends are the perfect time. ...and that's ok. But your pictures speak volumes. 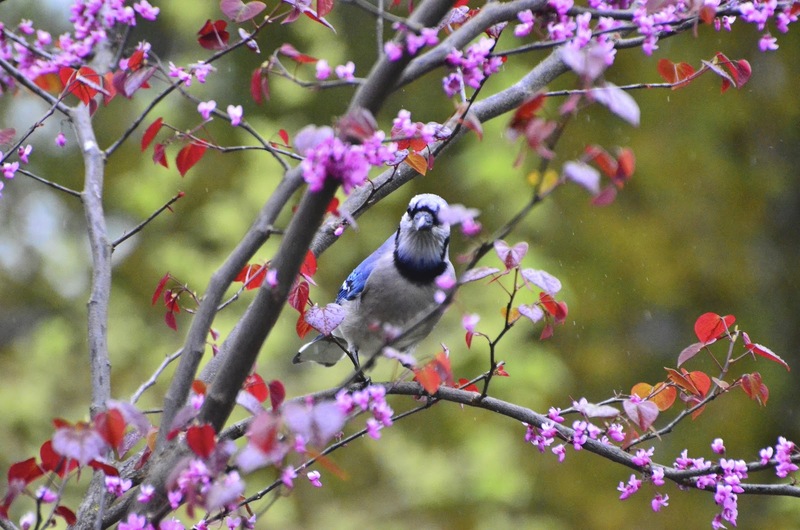 Loving the visitors to your Redbud. My weekend is a mix of lazy and busy...but these pictures! OH my! I am in love! That tree is spectacular and each different bird makes it even more special...What a great series to have hanging on your wall! Who needs words when a picture says a thousand? And in your pics a million. That purple is just gorgeous, indeed. Lovely post. Cheers!! As always, you take the best bird photos. 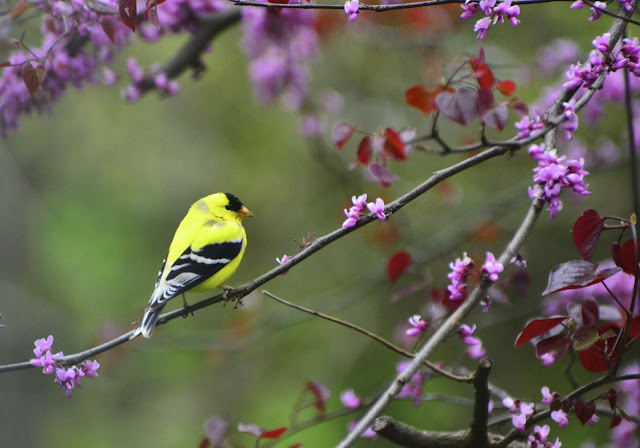 Your birds are so much more colorful than ours. Take care and keep taking those fabulous photos. 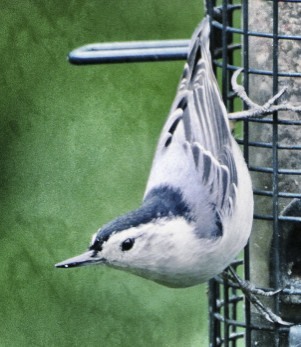 While refreshing my bird feeders this morning, I thought of you. I love your bird photography and these don't disappoint. I was laughing so hard when I saw your latest pelican pics. Glad he didn't get your camera.